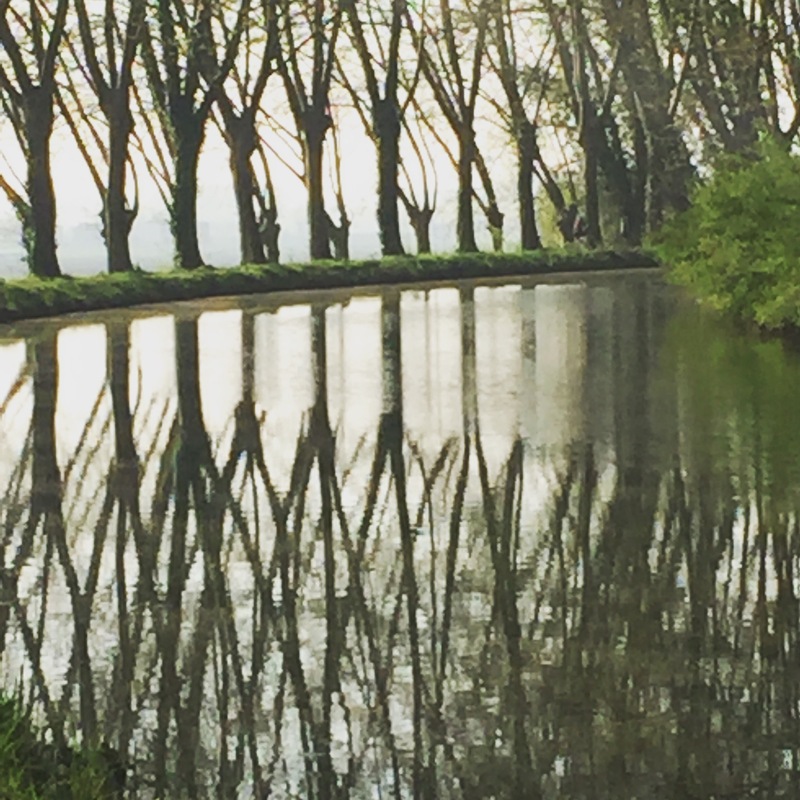 After a good breakfast, which included a fine selection of preserves made by our charming host, Catherine, we headed out into a cold, bright morning to make our way to the Canal de Garonne, and the veloroute Vers Duex Mers. Richard saying goodbye to our host, Catherine. She could not have been more helpful or considerate. Highly recommended! After around 10 miles, we joined the canal path, which would take us along a 100-mile almost traffic-free route to Toulouse, our destination for the day. Progress was good in the morning with our average speed over 30% more than in previous days. The scenery was varied and spectacular, accompanied by birdsong and the drilling of a spotted woodpecker. What a change from cars and trucks thundering past. I have to confess that I’m now back on performance-enhancing drugs. Three days ago I decided to copy Wiggo and I applied to Richard for a Theraputic Use Exception (TUE) for Ibuprophen. Unlike Wiggo, I do acknowledge the performance improvements these enable. They’re for nagging knee pain and eliminate my need to stop every 30 minutes and burst into tears, boosting my average speed significantly. We stopped frequently to refuel with pastries and chocolate bars, as part of a calorie-controlled diet. Lunch was a freshly prepared baguette at a bar in one of the villages along the route. 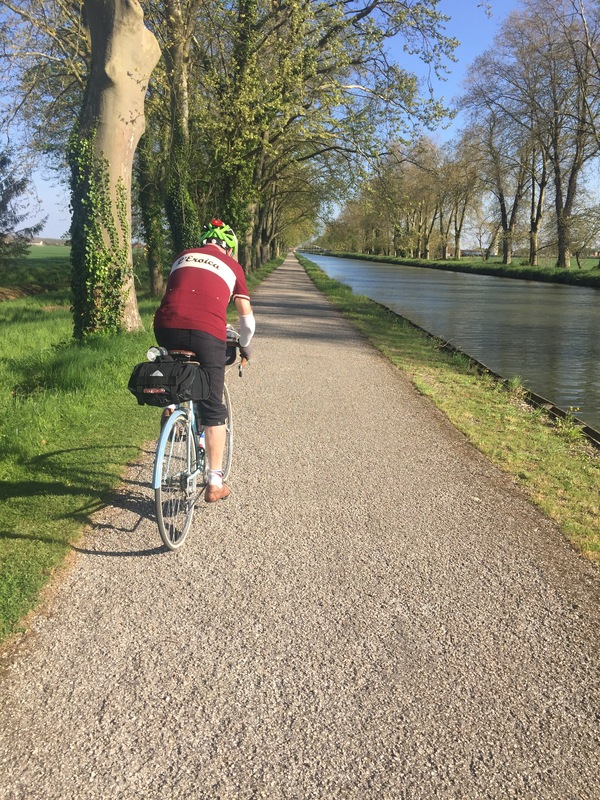 The weather was great – sunny but not too warm – but cycling on the flat has one disadvantage. Because you’re in the saddle and pedalling all the time, you don’t get the relief of standing out of the saddle as you climb, or resting your legs on long descents. Richard had a severe bout of bum pain for the first time on the trip, so we stopped for short rests more frequently than on previous days. I had a puncture in the afternoon, the first of the trip, which added another 30 minutes to our journey. It was therefore around 9pm before we arrived at our Best Western hotel in the centre of Toulouse. We had a late dinner at a recommended restuarant a few minutes’ walk from the hotel. By the time we got back to the room, I couldn’t keep my eyes open, hence the blog being posted this morning, rather than yesterday. 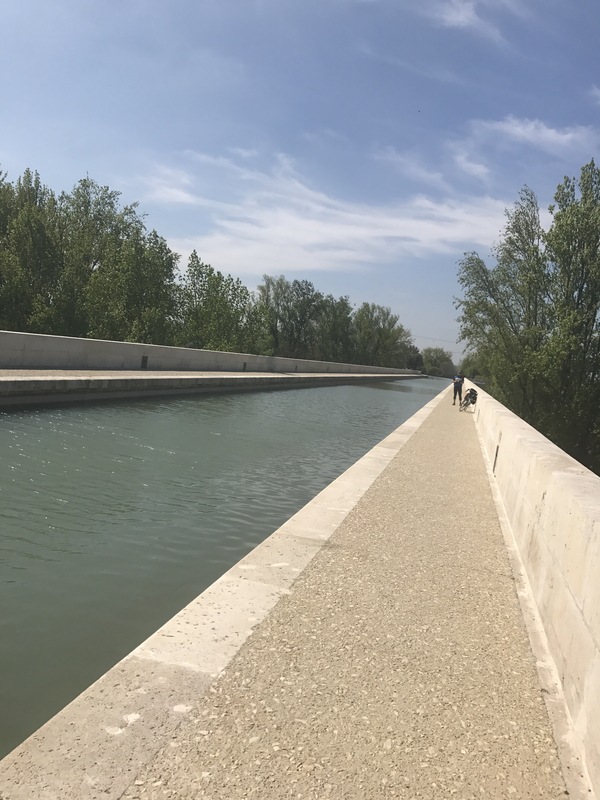 We covered 114 miles, our longest day yet, enabling us to set off towards Narbonne on the Canal du Midi this morning with 7 miles in credit against our 100 miles-per-day target. Wednesday’s journey took us from the manoir in Chandonnay to Jonzac then on via Montendre and Laruscade to the vineyards of Lalande-de-Pomerol, through St Emillion and into La Raole. The day started on fast, busy D-roads but our average speed was 30% higher than yesterday’s so we considered it worth the traffic terrors. It was a cold start to the day when we set out at about 8:15am but warmed up a couple of hours with the sun pushing through a misty sky with high clouds. I called home only to be passed a message that my youngest daughter, Matilda, is unimpressed by this blog because it has too many basic spelling errors. I’ve been through yesterday’s and corrected some of them but the combination of an iPhone screen and being completely exhausted when I write these blog posts is guaranteed to produce further errors. I’ll tidy everything up when I get back. The ride through the forest from Montendre to Laruscade was a delight. We probably only saw a car every 15 minutes or so. 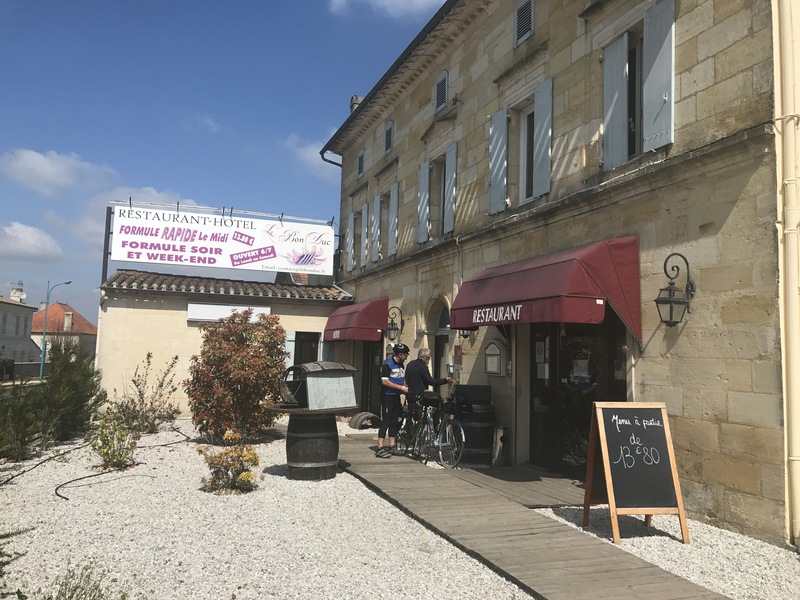 Just north of Libourne, which we had decided to circumvent to avoid heaving traffic, we came across a small restaurant and decided to stop for lunch. It looked busy and one table was occupied by six gendarmes so it couldn’t be bad, could it? When I walked in and asked for a table at 1:50pm, the waitress stared at her watch, obviously hoping if she could keep that up for another 10 minutes, she could tell me to go away. I stood my ground and she pointed me to a table. Richard and I both ordered moules-frites, but prepared in two different ways. In both cases the result was a smelly mass of emaciated shellfish accompanied a pile of greasy, unattractive chips. Whe Richard mentioned that the mussels stank, the waitress simply told us that she didn’t catch them but bought them at the local shop. This photograph of the lousy establishment is only included to ensure that others don’t make the same mistake we did. Two things have surprised me on this trip. Just how much effort has gone into creating cycleways and dedicated cycle routes, and how few cyclists we’ve seen. There were a few small racing groups on Sunday morning, and there’s the odd shopper but cycling does not seem to be important in France. What happened? We did spot a couple of guys heading in the opposite direction this morning but they turned out to be British. Laurence from the Ponsay manoir was quite dismissive about touring by bike, He said the French just don’t see the point. We rode east and south between the Pomerol chateaux. A few are grand but most are fairly modest buildings. There are a lot of them. 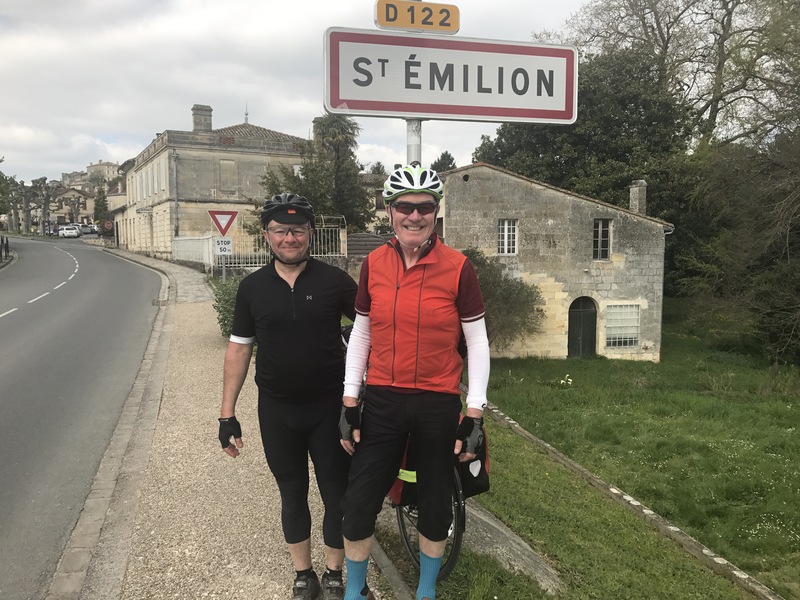 By mid afternoon, we reached St Emillion and asked a passerby to take a photograph of us under the road sign where I had one taken five years ago on my trip north on the Thanet. Like today, and recent days, there was a northerly wind blowing in 2012. At that time I was cycling north so it made the journey doubly difficult. This time, it’s helping most of the time. We reached La Reole before looking for a hotel. On booking.com we found the superb Chambre d’Hotes du Clos Semper Felix about 7 miles from Ste Bastille and made another last-minute booking. We arrived to a warm welcome, lamb stew, cheese and biscuits with sorbet for desert. The room is superb, and the bathroom has a heated towel rail. The latter may seem like a minor point but after five days on the road the opportunity to wash and dry travel clothes is a real find. At £60 for a twin room and breakfast, it remains a real bargain, despite the weakness of the sterling. We clocked up nearly 103 miles today. We still have about 7 miles’ deficit to make up but maybe we can do that tomorrow. In the meantime, as I sit on my bed writing this blog, I’m falling asleep. Time to go, and prepare mentally for tomorrow. With apologies for any typos and misspellings. I’ll fix them tomorrow! A cold start this morning but there was a friendly headwind so we made good progress at the start. Despite intentions of an 8am start, we got away from the manoir at about 8:30am. It wasn’t long before Richard needed to stock up with fuel for the day so about 12 miles into the ride we stopped in a small village to do so. This threw Google into fits of confusion and we were directed into every road out of the village in succession until we eventually found the right one. It was a hiller ride in the morning and we were again led down blind alleys, across unsurfaced farm tracks and through woodland. 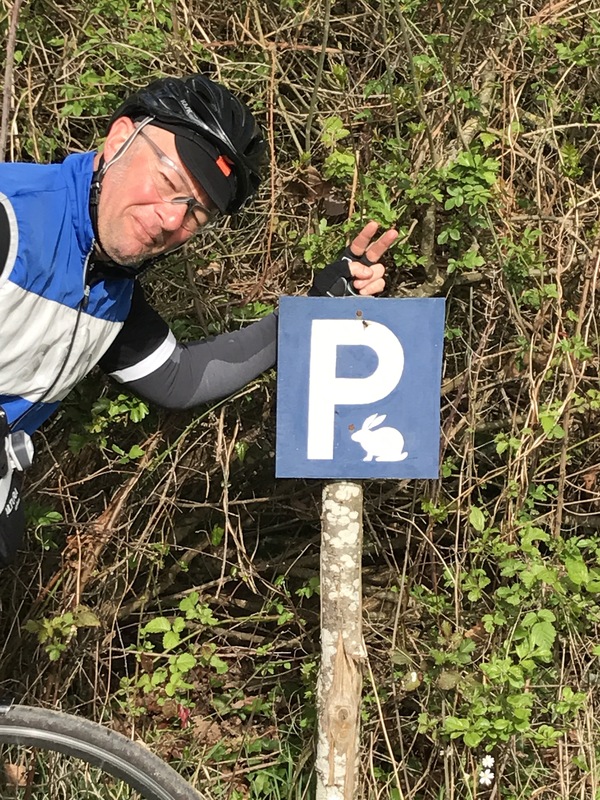 This makes for slow going with a fully laden bike but Richard was delighted to find somewhere to park his rabbit next time he visits the area. The poor roads, reminiscent of Italy’s strade bianchi and the classic L’Eroica vintage bike ride, kept our pace down and, when combined with stops, meant we were hard-pushed to make our 100 miles for the day. By mid-afternoon we got another soaking from the skies – not a downpour but steady rainfall for about an hour. Over the next couple of hours we dried out and set Pons as our destination for the day, initially expecting to arrive by about 7:30pm. It appeared to have a choice of hotels, so accommodation shouldn’t be a problem – or so we thought. Google can’t distinguish between this and a proper road. The future for autonomous driving looks bleak. We started to make excellent progress on proper roads. The ‘day three dip’ was behind us and we both felt the benefit of the previous three days’ ‘training’. Only misdirections and diversions from busy D-roads delayed us and, after sprinting through vineyards for the last hour or so, we finally arrived at Pons. The only hotel was full and the Auberge a little further down the road was closed for refurbishment. It was 9pm and beginning to look like we’d have to resort to booking.com then ride another 10 – 15 miles. It didn’t come to that after the Auberge owner came to the rescue. He had offered to tidy up one of the rooms for us, which was nearly finished, but apologised that he couldn’t provide breakfast. We accepted gratefully. 103.7 miles covered and a quick check confirmed that we’re just 10 miles off the pace to achieve our target. The bar-restaurant in the town stopped serving food at 9pm and it was now 9:20pm. However, the kebab and burger place 50 metres away was still open. Not finest French cuisine, of course, but I can’t remember the last time I enjoyed a couple of burgers and chips more. Back to the bar for a drink and coffee. I’m writing this in the same bar, where we’ve just had coffee and croissant. It’s the start of Day 5 and we’re aiming for 110 miles today to be back on target at the half way point. 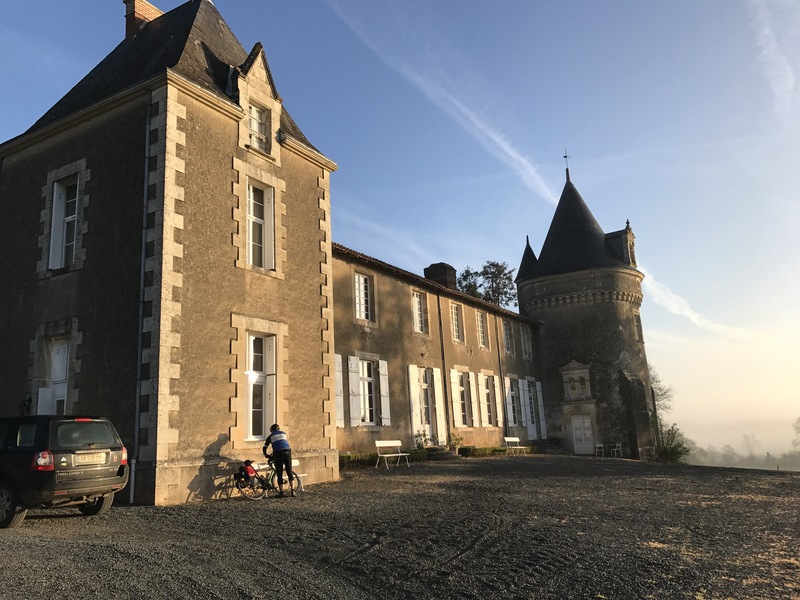 It’s 11pm local time and I’m writing this post from the Manoir de Ponsay, just outside Chantonnay, 91 miles from our starting point in Heric this morning. We didn’t make the full 100 today, leaving us with a deficit of 13 miles to make up, just as we had yesterday morning. There are a number of reasons for this, not least eating and drinking too much, and too late into the evening, yesterday. Despite a 7:45am alarm, we didn’t leave Heric until 9:45am on a cold, foggy morning. However, it wasn’t long until the mist cleared and we were treated to a warm, sunny day, albeit with a headwind for most of the day. Both Google and Michelin apps failed miserably by leading us along muddy grass tracks that were supposed to be roads, and into dead-end roads that delayed us at least five times during the day. 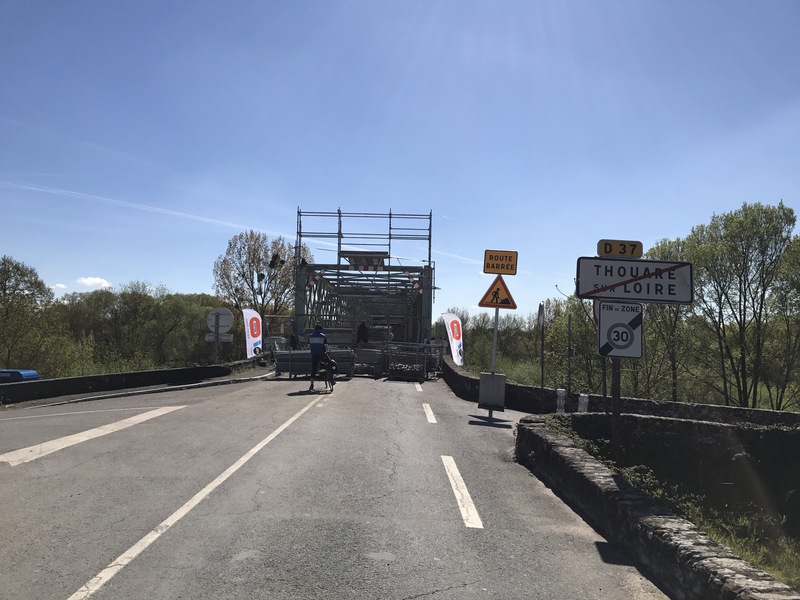 A lovely 3-mile ride alongside the Loire took us to the next available crossing. The terrain was a mixture of miles of flatlands interspersed with some long but not very demanding climbs and descents. Towards late afternoon the roads we were directed along became busier and we sought some quieter lanes for our journey. 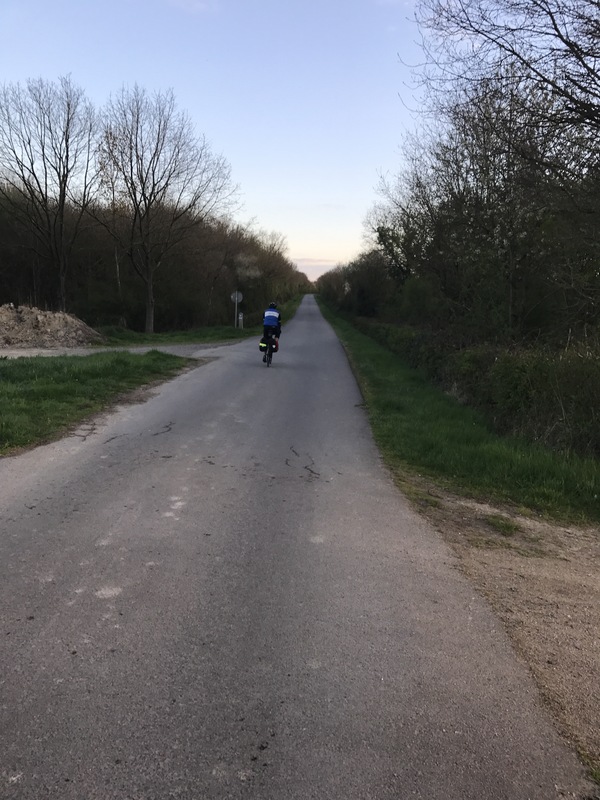 Having consulted Google once again, it appeared that Bazoges-en-Pareds would be a good place to find a bed for the night, although it would mean our day was cut short at around 84 miles. The village seemed to boast two hotels and an auberge but when we got there we found everything was closed until Easter, when the season begins. By now, it was 8pm and sunset threatened, in an attractive kind of way. Richard at a magnificent chateaux on a lake just a few miles from Bazoges. It was early evening. 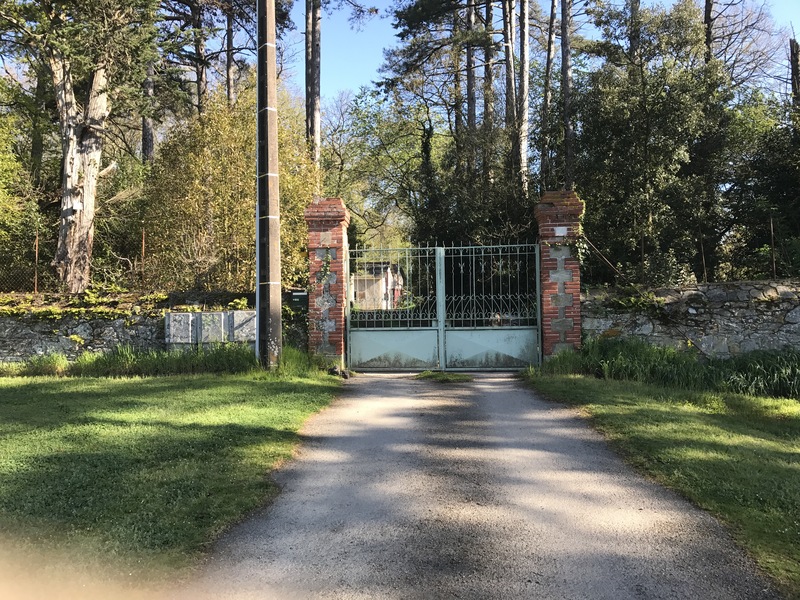 A check with booking.com again come to the rescue and the Manoir de Ponsay was revealed, albeit a little over six miles away. The owners, a couple, were not expecting us when we arrived and the 8-room hotel. They were only expecting one other guest, who’s car had broken down, so she was going to be late. 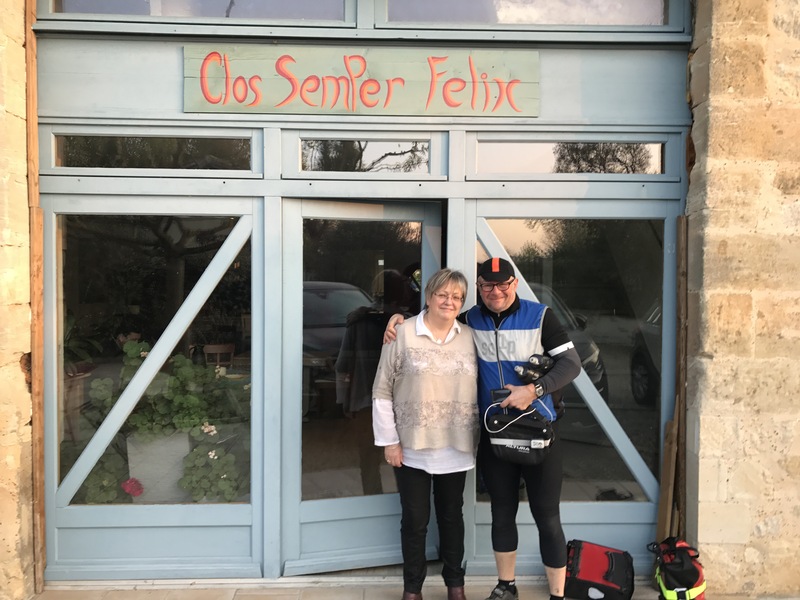 They could not have made us more welcome, showing us where to park our bikes, inviting us for a pre-dinner drink and then serving up a simple but very good meal of salmon, rice and peas followed by a selection of French cheeses. This was all topped-off with a desert made on the premises using a recipe created by the owner’s grandmother. Laurence, our host, told us a little about the history of the manoir. Built around 1440, it has been in his family since 1646. His father started running it as a small hotel in the 1980s but Laurence and his wife now live on the premises while struggling to make ends meet and keep the place afloat financially. The cost of repairs and high rates of taxation threaten Laurence’s ability to keep the magnificent building in family hands much longer – what a responsibility. As I mentioned earlier, after today, we’re back to being 13 miles behind our daily target but tomorrow’s another day and we’ve promised ourselves an early start – bums and knees permitting! After a day on the Brittany ferry dinner was devoured, and it was excellent. A quiet crossing was then rudely interrupted by a 6:45am (5:45am in UK time) know I at the door when breakfast was delivered to our cabin. The start from St Malo was slow. Under leaden skies, we searched for an ATM and then a coffee, both searches taking longer than they should, and we finally got to edge to the city around 10am. Then the confusion started. Navigating by Google Maps took us straight toward a main road with a no-entry sign for bicycles despite the fact that we were on the recommended route for bikes. Richard had the Michelin map guide on his iPhone, so we switched to that and used it most of the time but throughout the day were sent down blind alleys and lost a fair amount of time. As we headed south in the general direction of Nantes, it remained chilly and cloudy but most of the roads were reasonably quiet. We stopped at a roadside bar where four excellent coffees and a large bottle of water cost 6.70 Euro. I thought back to San Francisco where that would probably have been the tip. Rural France still offers great value, even after the pound’s recent devaluation. Once again birdsong accompanied the journey. Chaffinches are everywhere, as are buzzards, I also spotted a wren, a kestrel and most cheering of all, a solitary swallow, a sure sign that summer is not so far away. We cycled through the city of Rennes where, at least on our route, there was nothing to recommend the place. It’s an architectural desert full of concrete blocks of apartments and walls covered in graffiti. Both navigation systems seemed to want to take us onto a motorway and in the end we gave up, ingnored the no-entry sign and within about 400 metres joined a cycle lane. The terrain considered of long, straight Roman roads and rolling hills. By the 60 mile point, we were both tired and Richard questioned the sanity of our 100 miles-per-day target. Then he had a puncture. We fixed it quickly and pushed on. Despite a weather forecast of rain, we didn’t get any. That was relief and we started to make better progress on quiet roads where we’d sometimes not see a car for miles. The sun came out and we were treated to a beautiful spring evening. Our pace quickened and as we approached our 100-mile target at around 6:45pm, we stopped and used our phones to find somewhere to stay. Due to a bit of finger trouble with booking.com, I booked a hotel that I thought was two miles away but turned out to be 14 miles south. At least is was on our route. 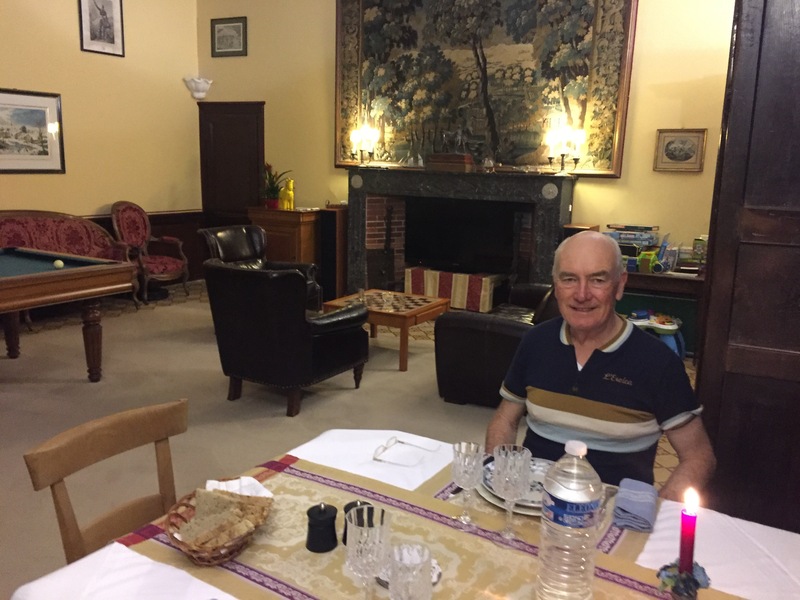 After only a few more misdirections from the navigation system, we rolled up to the Logis L’Abreuvoir hotel in Heric, to the east of Nantes, at 8:40pm. It was quiet, with two couples in the restaurant. We had a great dinner accompanied by copious drinks, and slept like babies, with the exception of the snoring! With 108.5 miles under our belts, we had eaten into our target deficit of 13 miles from the first day – it was only 87 miles to Portsmouth. Our third day’s riding should see us back on track. After an impromptu birthday party early Friday evening, and an interrupted night’s sleep with the jet lag still making its mark, I staggered out of bed at 6:30am on April 1st, aiming for a 7:30am start. Richard and I finally made it out of the door at 8:00am, having agreed that the slightly shorter route to Portsmouth – around 85 miles instead of 105 miles – might be prudent for the first day of our ride to Majorca. The weather forecast had been changing by the hour but had got to the point where we had a reasonable expectation of staying dry, an expectation that was not met when a torrential downpour soaked us both. That was around 1:30pm when we were just south of Salisbury. Then the sun came out and we dried out. Then we were soaked again before finally getting a few hours of sunshine that dried us out once more. In the early part of the ride, Google took us along the A350 – a main road with enough trafffic to make us more than a little nervous at times. Later, we joined up with the wonderful Wiltshire Cycleway, which took us into Salisbury for an early lunch. The variety and volume of birdsong always strikes me when riding country roads in Wiltshire and today was no exception. What a difference from the last 3 months San Francisco, where birdsong was most noticeable by its absence. We crossed the stunning River Test in Hampshire and, as always, stopped on a bridge to spot the trout feeding below. This chalk stream is one of the premier trout fishing rivers in England. In places, it can cost hundreds of pounds per day to fish it and in about six weeks time, we’ll enter the so-called ‘duffers fortnight’. This is when the mayfly hatch sends the trout into a feeding frenzy for two weeks and it’s said that even the most incompetent of fishermen can’t fail to catch them. We also passed the first vinegard we’ll see on our trip, and we’ll cycle through many more before reaching the French – Spanish border at the Pyrenees. Google Maps has already become the navigation aid of choice for our trip, even though we both have Garmin GPS gadgets to record the ride too. Google on the iPhone strapped to my crossbar worked reasonably well until somewhere around Botley, near Southampton. At this point we went off the preferred route, the spoken instructions being drowned out by ttaffic noise. This meant cycling along some more main roads but the sun was out, so it wasn’t all bad. The limitations of Google Maps became apparent when we arrived a dead-end lane with an expanse of water ahead of us. No sign of a boat, even though the destination had been set as “Portsmouth Harbour.” A local resident explained that we were still four miles away from the Brittany Ferries terminal and the we were not the first to end up in the middle of nowhere thanks to some quirk of the navigation system. 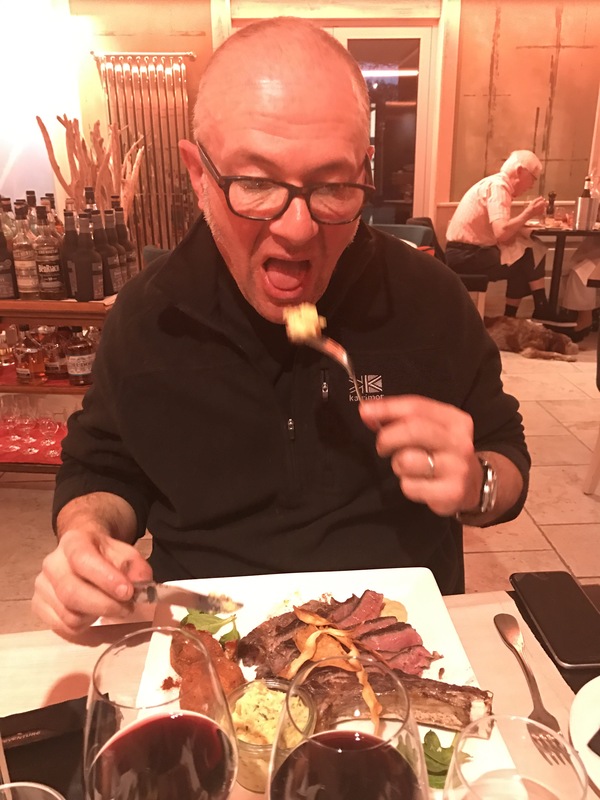 We boarded the 8:15pm Brittany Ferry to St Malo in good time, and checked into our comfortable, deluxe cabin before enjoying a sumptuous, five-course dinner with wine. Everything tasted amazing after 87 miles in the saddle. Tomorrow, we head towards Nantes, aiming to cover at least 100 miles to keep on track for our target of 1000 miles in 10 days. The weather is supposed to be good, with no rain forecast. But it wasn’t forecast yesterday either! It was a rather grey morning in San Francisco today but having ridden only a couple of hours a week for the last three months, I decided that a little training ride for the upcoming South Wraxall to Majorca ride was well overdue. My youngest son, Harry, turned 14 at the end of January and the magical year when we ride bicycles together at about the same speed has arrived. By next year, I’m certain that the 50 year age gap will begin to tell and I’ll be looking at electric bikes to give me a fighting chance to keep up. We drove north over the Golden Gate Bridge to San Rafael then rented a couple of mountain bikes from Acme Bikes – a great bike shop at one end of the town where we first hired some three weeks ago. 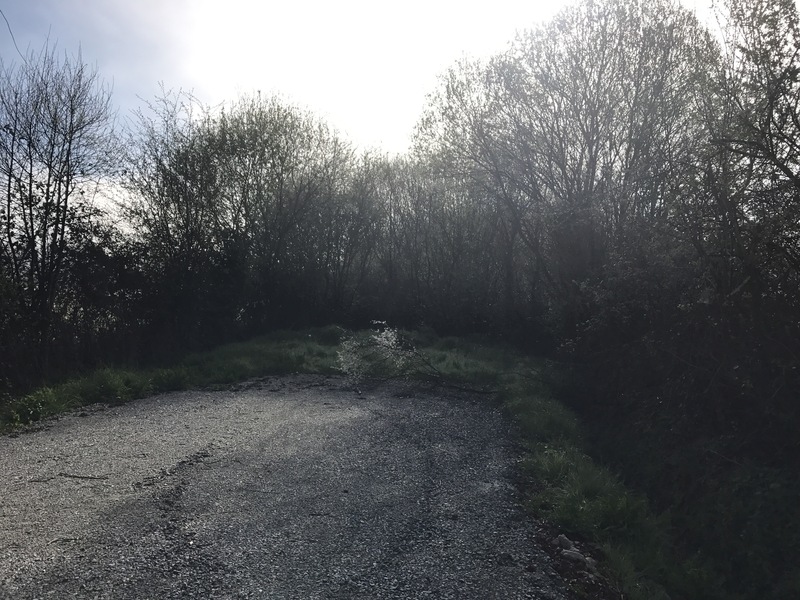 The ride along the roads then up into the China Camp State Park proved challenging in the hills because the heavy rains in January have made some of the single track trails all but impassable. Nevertheless, the exercise was good and we survived the challenges without injury – I’m more than a little nervous when it comes to downhill mountain biking! This morning’s training ride in China Camp, Marin Country, CA. Since his 14th birthday in January, Harry has become taller than me. The other good news is that he’s now outgrown his size 10 shoes and I’m being treated to some rather nice hand-me-downs. 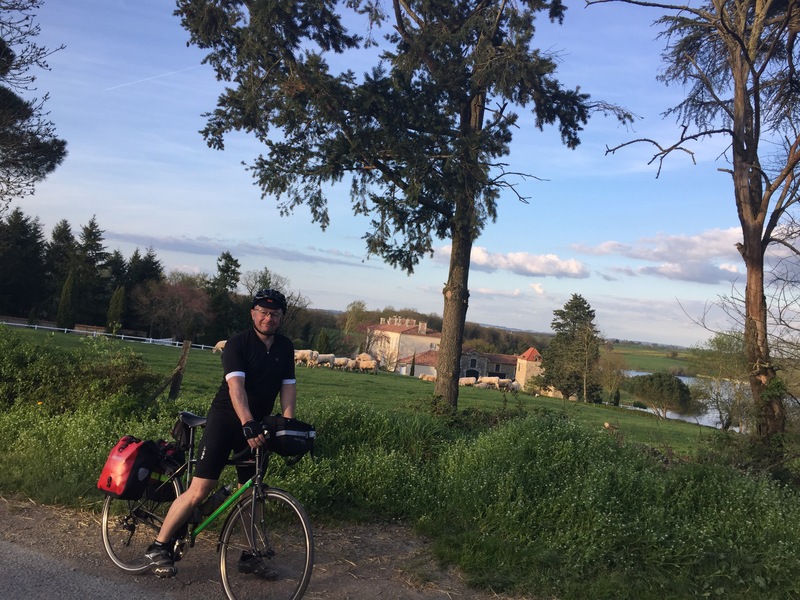 Richard Stanton, my companion for the upcoming 1000-mile continental adventure, is commendably taking the opportunity to raise money for one of his favourite charities, St Mungo’s, which provides support for the homeless and helps them rebuild their lives. It’s a cause he’s passionate about and he’d greatly appreciate any contributions. Please consider supporting him through his JustGiving page. We’ll keep you posted on progress here too. 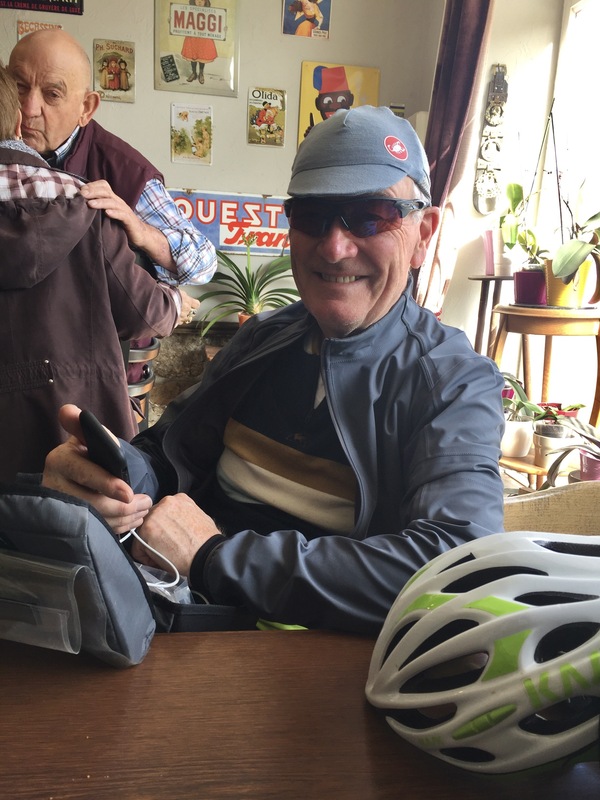 It’s been a while since I’ve had the time to write on this blog but as my 65th birthday approaches on April 1st I thought it time to attempt another reasonably challenging ride and to create a record of the experience. On my 60th, I set out from Barcelona on a 1950 Thanet Silverlight and rode it back to where it was made in Bristol, the city where I was born. Apart from a slight problem with a worn axle, the bike didn’t miss a beat and I didn’t even pick up a puncture over the entire 928 mile journey. The story of that little adventure is recorded elsewhere in this blog, starting here. To mark my 65th, I’m going to go in the opposite direction. 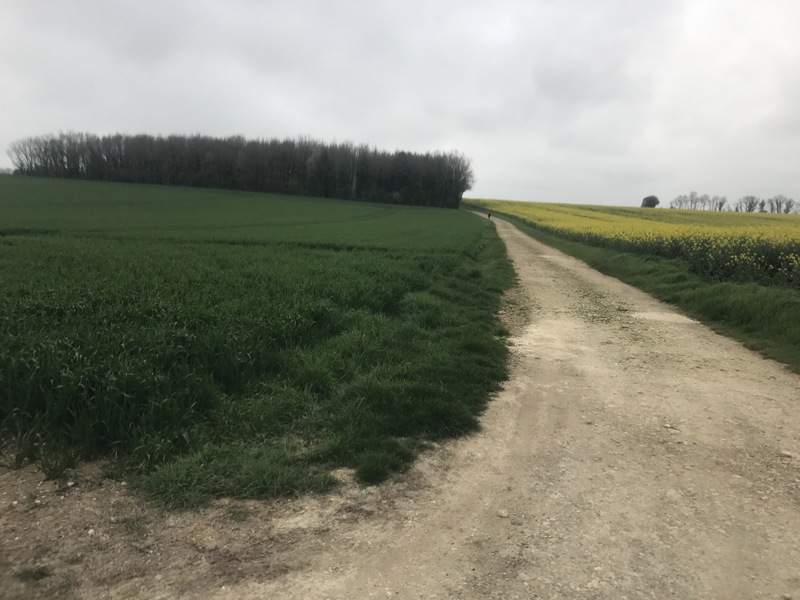 Around 7:30am on April 1st I’ll set out from home in South Wraxall, Wiltshire, which is about 7 miles east of Bath, and head towards Barcelona, largely retracing my steps from five years earlier. This time, I’ll have company. My good friend Richard Stanton, who lives in the village, is joining me, which will mean I don’t have to talk to myself for two weeks! Our goal is to ride 1000 miles in 10 days. Barcelona is only 900 or so miles from home so the idea is to take the overnight ferry from Barcelona at the end of day nine and complete the last 100 miles riding around Alcudia on Majorca. I’m coming back to the UK from California, where I’ve just spent three months on business, on March 28th, so there won’t be much preparation time. What’s more, I’ve still not settled on which bike to take – I have four that are around my vintage, including a Paris Galibier and a Hobbs of Barbican Blue Riband. The former is set up with a single chainring and is heavier, so would be a little more challenging. I think I’ll probably go for the Hobbs – it’s a 1950-52 frame, a late one, with a mix of 1980s Suntour and TA parts as the chain set. Five years on, I think I need a little more flexibility than that offered by the 1949 4-speed Sturmey Archer hub that powered my 2012 jaunt. Richard is of a more sensible disposition so will ride his Genesis steed. In practice, I don’t think there will a great deal of difference in performance, and we certainly won’t be racing, even though I’m assured that riding north to south means it’s mainly downhill! My previous post looked at the transformation of a cheap 1978 Falcon Westminster into a reasonably attractive bike that performed faultlessly over the Tuscan hills during L’Eroica 2013 and is proving to be a joy to ride through the winter here in Wiltshire. I upgraded some components, using vintage parts, but kept the originals that were in good working order. Here are a few things I learned while rebuilding this bike, and a couple of similar ones before it. Today’s compact double is typically a 50/34 teeth set up. In the past I’ve duplicated this in vintage style using TA Spécialités (Pro 5 Vis) chainrings, inner versions of which can go as small as 28 teeth. (Sheldon Brown made good use of this in an unusual combination for his Hetchins.) You can still buy them new today. My original plan was to make up a compact double for the Falcon but after cleaning up the original Stronglight chainset (which I think was the Model 101) I decided to keep it. The chainrings had 48 and 36 teeth. Using this combination with a wide range Suntour 5-speed freewheel (15-32 teeth), I found that most of the time I ride on the 48, rarely having to move beyond the middle of the freewheel to climb most hills. In the highest gear, I’m still getting traction at well over 25 mph and for my type of riding that’s fine. If you usually ride a 53/43 or something equally macho, try a 48/36 – you’ll ride with a better chainline most of the time and find yourself shifting less. Similarly, if you’re used to having 9, 10 or 11 gears on the back (which my summer bikes do), try a wheel with a nice old 5 or 6 speed freewheel. You’ll discover that it actually makes cycling easier. With a lot of rear sprockets you’ll rarely shift by one because it doesn’t make much difference, so you end up shifting at least twice for every desired gear change. When you only have 5 or 6 to choose from, once is enough. Incidentally, I find the 12-teeth difference between the chainrings on the front very useful for short, sharp hills. As soon as I start to feel heavy pedal pressure, I drop to the smaller chainring, rather than select a larger sprocket on the freewheel. The 12-tooth difference means that I don’t find myself suddenly spinning and having to shift up at the back. I can stay on the same sprocket there. Once again, it’s easier than riding a typical compact double set up with a 16-tooth difference at the front. Of course, if you want a large sprocket for low gears on the back you’ll need to be careful to select a suitable derailleur – they can’t all handle the range – but most Suntour units will cope very well. The original friction shifters on the Falcon Westminster were Shimano of some sort and in pretty scruffy condition. I’m becoming a creature of habit regarding down tube shifters and nearly always fit Suntour Powershifters. Forget Shimano and Campagnolo of the same period (1980s) – the Suntour shifters, of which there are several models including the ‘Superbe’ versions, have a simple ratchet mechanism that stops the annoying slippage in low gears that plague most friction levers. Suntour Powershifters eliminate slippage in lower gears (when the cable is under tension). Some were marketed under the Raleigh brand. You shift, feather the position a little if you need to, then forget it. They just don’t slip. You can pick these up for a few pounds on eBay and some, like those in the photograph, are Raleigh branded. Of all the parts that have given me grief on older bikes, old single-pivot brakes are the biggest offenders. They are often difficult to set up, pull to one side easily and have very little stopping power compared with modern counterparts. Weinmann 650 centre-pull brakes offer some relief from these problems but use a special bridge cable with a flat piece on each end that slots into the brake arms. To my mind, the French Mafac Racers are a better option. On Mafacs, the bridging cable has a little spigot on one side and a cable clamping mechanism on the other. I find standard gear cables work well, so there’s no need to go searching for dedicated, specialist cables. The brakes, which were made for over 30 years from the 1950s, provide strong braking with either matching Mafac levers or other non-aero types. I picked up a couple of pairs for £5 each from local bicycle charity enterprises. I stripped and cleaned them very easily, replaced the Delrin (plastic) washers, and then treated them to a set of Koolstop brake blocks. I found someone to manufacture replacement washers because they’re no longer available anywhere else. I had to order a minimum economic quantity so I’m selling the surplus ones here. The Koolstops maintain period appearance but deliver excellent stopping power. (They cost more than the brakes themselves, of course). The salmon pink ones are supposed to offer better performance in the wet. Comfortingly, they still squeal like the originals, eliminating the need for a bell on your bike. For L’Eroica 2014, I’m now building up a Roberts frame from 1980. To conform to the rules, all the components must have been made before 1987. TA Spécialités, Suntour (who first made indexed down tube shifters in 1986) and Mafac will be featuring on this bike too. I’ll post more details later.